Next time you’re in Rajasthan, head west. 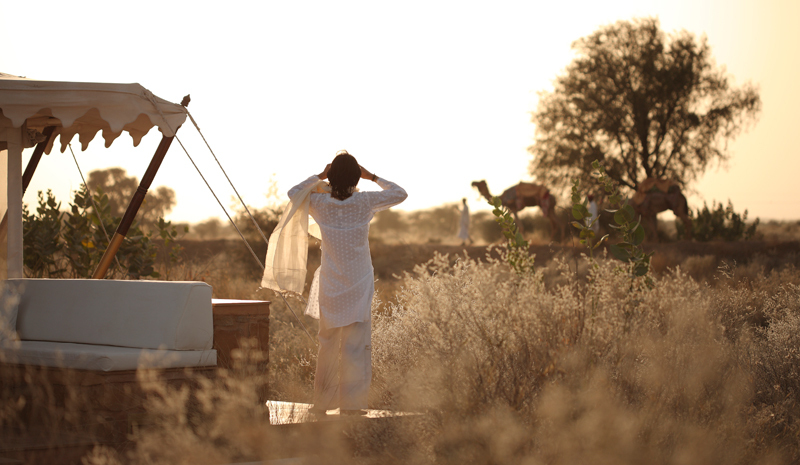 Beyond the busy cities and popular tourist destinations of the Land of Kings, the golden dunes of the Thar Desert await. Also known as the Great Indian Desert, this extraordinary tract of land covers 120,000 square miles and stretches from Rajasthan into Pakistan, Gujarat, Punjab, and Haryana. It’s wild, remote—and among India’s most beautiful natural attractions. 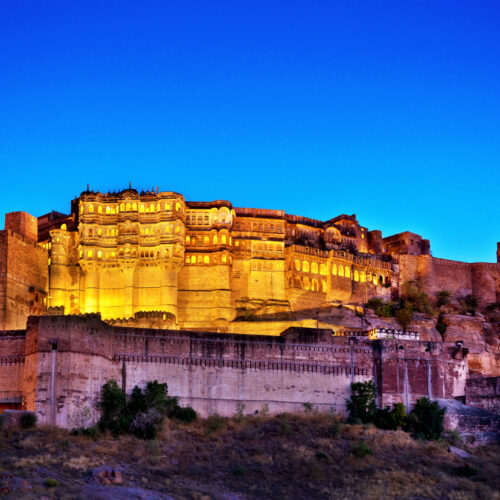 To better explore this unique corner of the country, embark on a Rajasthan desert tour. 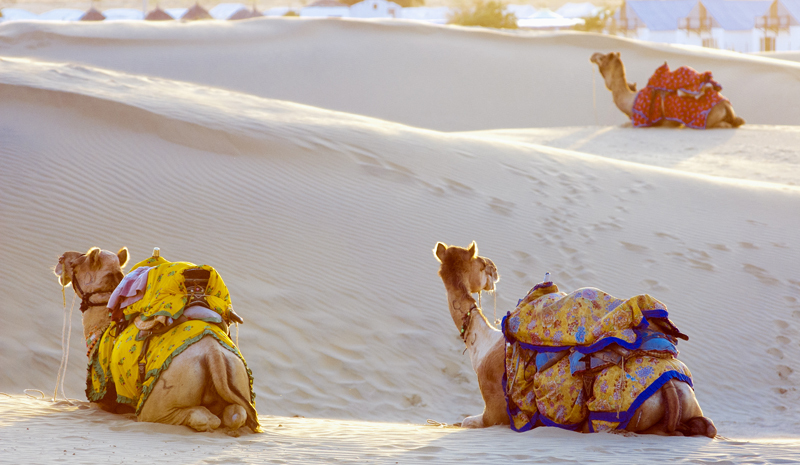 Whether you choose to go on a one-of-a-kind camel safari or head off on a midnight driving tour of the dunes, there’s more than one way to discover the magic of the Thar Desert. Long-legged camels are a frequent sight in the Thar Desert—and they also serve as the perfect way to explore its shifting sand dunes. Hosted by Reggie Singh (the grandson of a local Maharaja), this luxurious camp is located on the flanks of the great desert. By day, go on camel safaris of the region and drop into local villages; by night, the comfort of the tents awaits. As a bonus, you’re also just a quick journey from the extraordinary Osian temples. 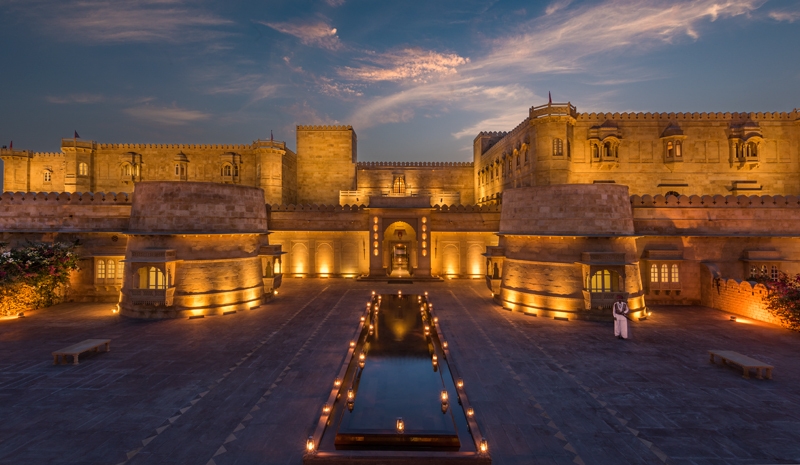 Jaisalmer, famous for its tremendous sandstone fort, is the last major outpost you’ll reach before plunging headlong into the wild landscape of the Thar Desert. The Golden City is also home to SUJÁN’s The Serai, an extraordinarily luxurious tented camp that immerses you directly in your natural surroundings. Located on 100 acres of private desert scrubland on the edge of the city, the camp hosts camel journeys, tours of the nearby abandoned city of Kuldhara, village walks, and other ways to discover the evocative setting. 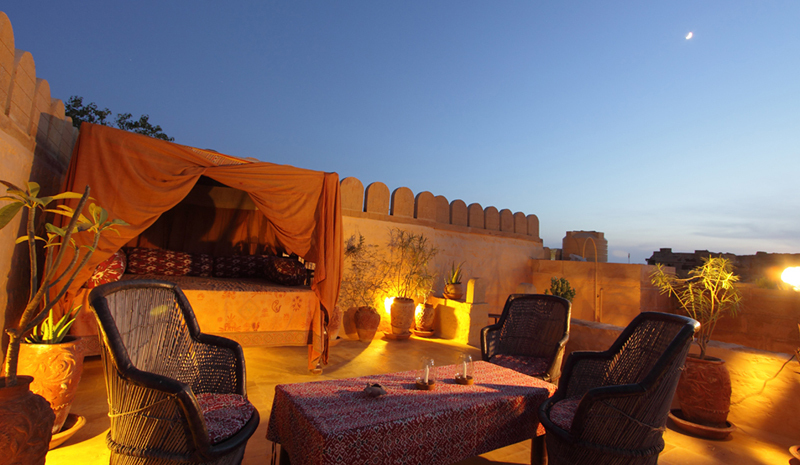 Another luxurious destination for a Rajasthan desert tour is Suryagarh, a boutique hotel in Jaisalmer that’s perfectly positioned as your gateway to the Thar Desert. 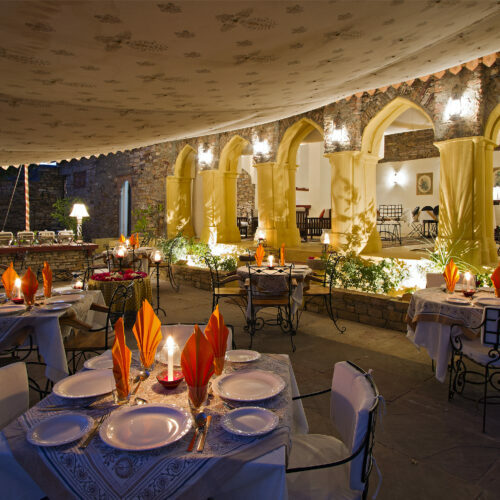 Whether you spend the night in one of its lavish rooms or standalone haveli suites, every aspect of your stay will be suffused with Rajasthani magic. And then there are the excursions: head off into the desert on camelback, go for a drive past ancient watering holes, traditional villages, and historic cemeteries—and even see the desert landscape illuminated by moonlight during a nighttime drive. 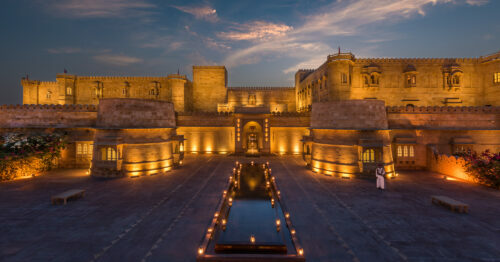 You can’t say you’ve fully experienced Jaisalmer without visiting its colossal, 12th-century fort. But one of the most evocative ways to get up close and personal with this UNESCO-grade marvel? Stay within its walls—literally. 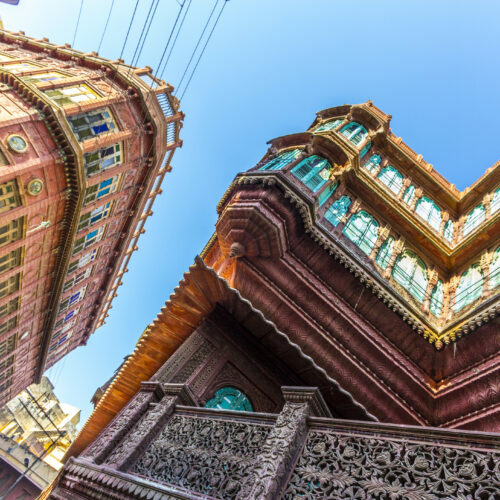 The Killa Bhawan Hotel is located inside one of the world’s last remaining citadels, nestled directly in three of its bastion walls. Comprising just eight heritage rooms, it’s deliciously private—and upon waking, you certainly won’t have to venture far to indulge in some memorable sightseeing. It may be arid, but from its colourful villages to the camels and other wildlife that call the area home, the Thar Desert is still full of life. That’s especially true during the annual Desert Festival. 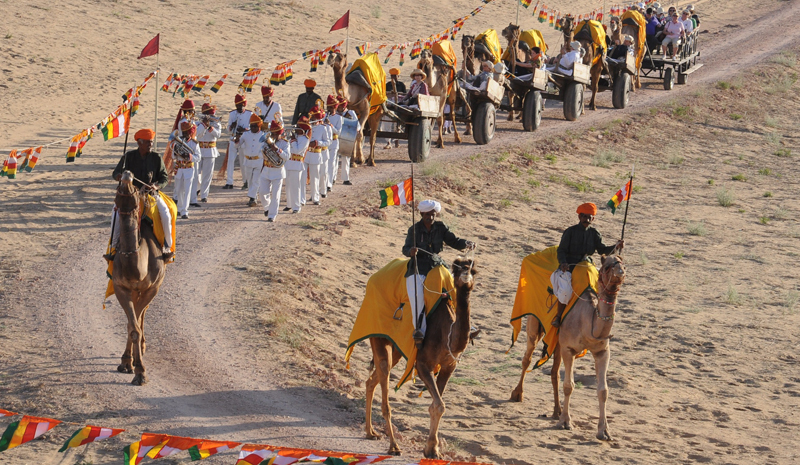 Held in Jaisalmer at the end of January (it will return next on 29th–31st January 2018), the event is a must on any Rajasthan desert tour. Amidst the golden sands, you’ll get to take in colourful costumes, dance performances, camel races, enticing food and handicraft stalls, and other enchantments.